Credit: Screenshot from the Washington Post. "I feel like we did it, we finally created something that was not a text story with assets inside of it, or a video with a little bit of text written to it, but truly a story that depends on all of these pieces to communicate something." 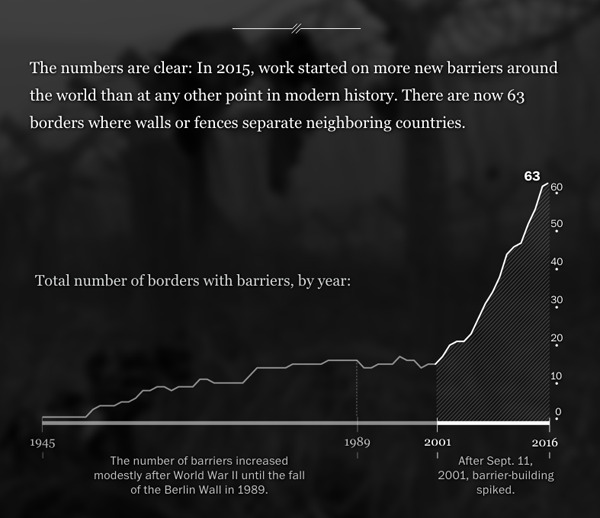 Kat Downs, graphics director at The Washington Post, was part of the team that created A New Age of Walls, a three-part series examining why countries around the world have started building physical barriers on their borders. 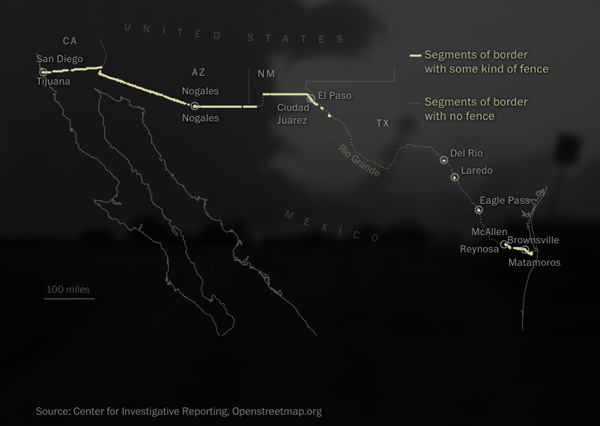 The series was prompted by the idea of building a wall on the Southern border of the United States, which has featured prominently in political discourse ahead of the upcoming US presidential election. The team set out to explore both the international trend towards introducing physical barriers on borders, and to shine a light on what life is like on the US-Mexico border and the implications of building a wall there. "We thought this could be a story that we could tell really in a way that was different to anything we've attempted before, both in scope and in technical and visual approaches," said Downs. Each episode from the series includes videos, essays, and graphs, and the experience has been tailored to appear slightly differently to viewers depending on whether they are accessing it from their mobile phones or watching on a desktop computer. The episodes were made available on 12, 14, and 17 October. The concept behind the project was to collect as much material as possible during the newsgathering process, and to then identify which medium was best to tell each part of the story. "Most of the time, a lot of projects in newsrooms start from one medium or another. They start as a video documentary, or they start as a text, so it can be really hard to make it feel like a truly integrated narrative," Downs told Journalism.co.uk. "The text communicates what is best done in text, the video communicates what's best done in a video, the graphics communicate what's best done in graphics – that synthesis took a lot of time and effort." Seven journalists and editors, including Downs, worked on all aspects of the project, from developing the editorial vision for the series, to reporting and executing the episodes. "Everybody was involved across that full spectrum. One of the things I really believe in strongly is that if you want to do journalism differently and if you want to tell stories differently, you have to report them differently, and you have to put people in the field who are going to see things differently." The team ensured visual storytelling was at the core of the newsgathering process, and filmed every interview as well as "a tonne of 360 video" and other materials that were left out of the final project. Another aspect that influenced the format of the series was the barrier of entry to most multimedia digital storytelling projects found online today, where readers have to spend a long time going through each part of the story without being able to skip through. 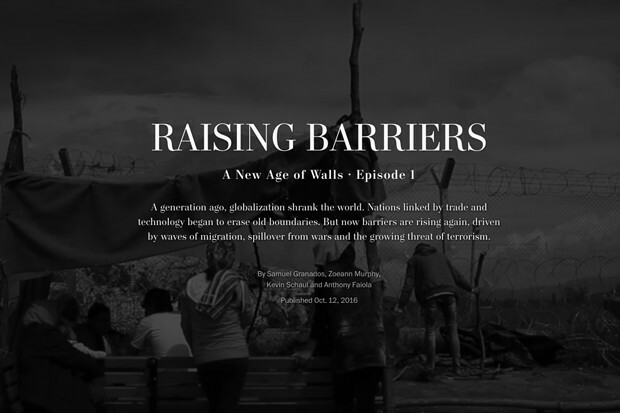 In each episode of A New Age of Walls, the individual elements of the story are bite-sized and transcripts are available for each video in case readers want to skim through certain parts. On desktop, the experience is designed as a slide-show readers can scroll through, while on mobile it appears as a set of cards. On both platforms, viewers can experience the story with or without headphones. To keep viewers interested in following the series to the end, The Washington Post offered early access to the second episode of Raising Barriers for those who had finished watching the first. Downs told Journalism.co.uk this idea was a way to maintain the existing audience for the project, people likely used to on-demand viewing from services like Netflix, but also to keep an element of freshness around each episode so the team could promote the series continually until the final instalment was released. 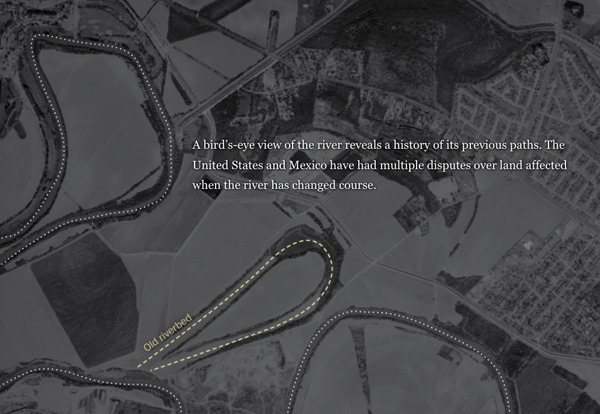 The Washington Post has previously produced The Waypoint, a visual documentary chronicling the journey of refugees, a project born out of a similar drive to experiment with online storytelling. "It's highly based on collaboration. It's only possible when you really have a tight team and you have a strong vision for what you want to do, when you have that deep collaboration and belief that you can do something that's mould-breaking."